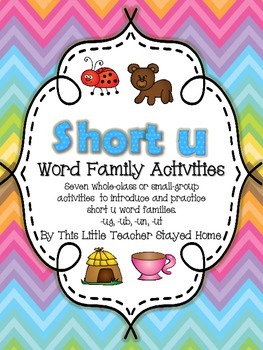 Activity 1: Short u poster to use as an introduction or classroom resource. Activity 2: Pocket chart word sorts. 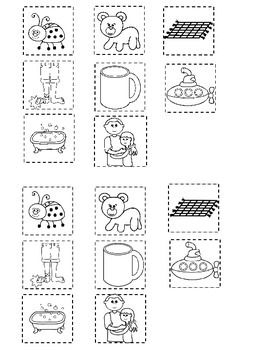 There are 14 full-color picture and word cards for 2 days of sorting activities. 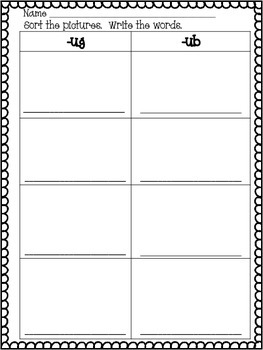 A recording sheet is also included in case you want to add the activity to a literacy station. Activity 3: Sort and Write independent work. Kids cut out the pictures and glue them onto the sorting sheet under the correct word family heading. Then they write the word that names the picture. There are 2 different sorts (-ug/-ub and -un/-ut). 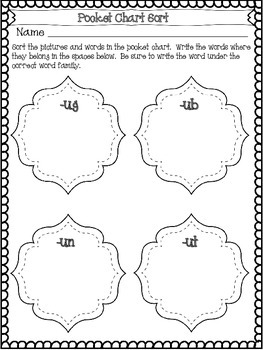 Activity 4: Students write the short u word under the picture. Activity 5: Listen and Write. Teacher chooses 6 words from the various word families. Call out the words and have students write one in each box and illustrate. Can be used as a quick assessment. Activity 6: Students list 2-3 words that belong in each word family. This can also be used as a quick assessment. Activity 7: Memory Game. I have included picture and word cards for 12 short u words.